Sapphires with perfect clarity are very very rare. Even the highest quality, most expensive sapphires can usually get away with having some slight inclusion (internal flaw). The clarity of a sapphire really affects its value when it is not clear enough to be faceted. 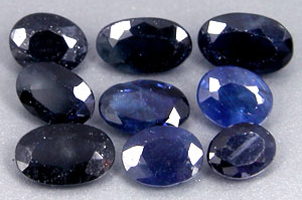 Sapphires of such poor clarity can be heavily clouded or almost opaque. Sometimes, inclusions or internal flaws can even add value to a sapphire. Some sapphires contain inclusions of another mineral called rutile. The inclusions form in a special way so that they form a 6 pointed star on the face of the cut cabochon. A nice blue color with a very well pronounced white star in the center can be worth much more than a perfectly clear sapphire of the same size. 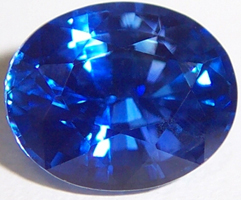 Very poor clarity: The clarity of this sapphire is so poor that it could not be faceted. You can see that it is not very transparent and light does not reflect from inside it. Poor clarity: These sapphires are just barely clear enough to facet. There are areas inside the stone that are transparent, but for the most part they are heavily include_onced. Perfect Clarity:This sapphire has no visible inclusions whatsoever. Clarity this perfect is hard to find in a natural sapphire. I have purchased a Neelam , which is not at all clear , its around 4-5 Carat, however while seen in light it shows lot of impurities , light can barely be seen . Can u suggest , if neelam is good or not at all good. hellow sir which neelam is better,the darkblue or sky blue?